The genus Acer includes evergreen and deciduous trees and shrubs known as maples. There are roughly 150 species of maple, and most of them are native to Asia’s mountain forests. Notable species in the Asiatic maple garden include the paperbark maple, Acer griseum, and the graceful A. rubescens. You can also find interesting maples throughout the Arboretum. Look for Acer tegmentosum and A. davidii in the peonies and the hornbeam maple, Acer carpinifolium, in the old nursery. 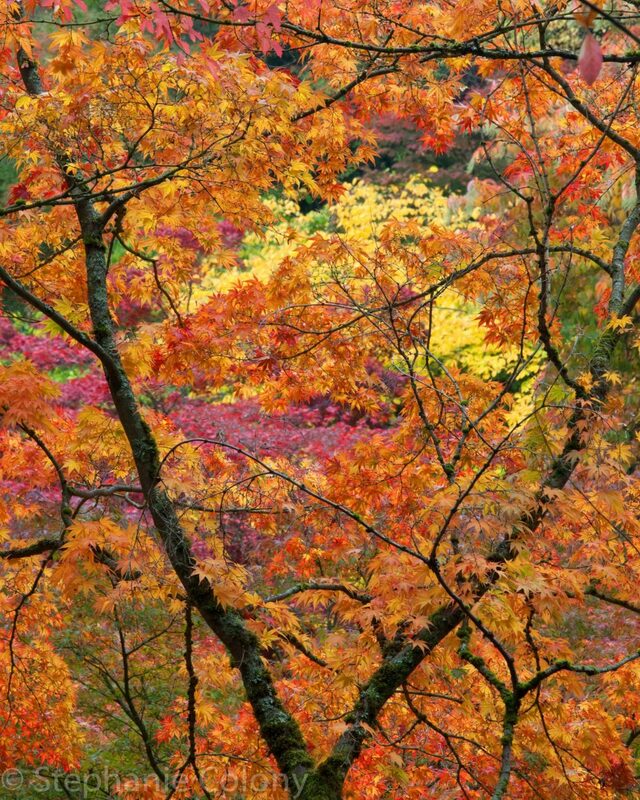 You might notice that there is one garden for Asiatic maples and another for Japanese maples. Wondering why? It’s because the Japanese maple, Acer palmatum, has many, many unique cultivars – more than enough for an entire garden showcasing just this one species. Our collection is part of a multi-site Nationally Accredited Plant Collection™ for Maples (Acer), administered through the Plant Collections Network of the American Public Gardens Association. Birches, alders, hazels and hornbeams are among the trees in Betulaceae. Many birch trees have white or gray papery bark, but not all of them do. 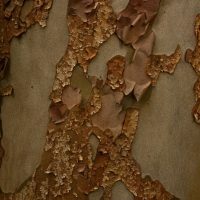 In the Arboretum, you’ll also see red-brown and yellow bark. If you detect of hint of aromatic wintergreen in the air, it’s coming from the inner bark of the yellow birch. Birches are known to be hardy, since many species can withstand cold temperatures, poor soils, harsh exposure and bad drainage. Of course, planting your birch in well-drained deep loam would be all the better. If you’re planting in a light-filled and wind-swept spot, choose a white-barked species such as the canoe birch, Betula papyrifera, or Himalayan white birch, B. utilis var. jacquemontii. If you’ve got shade and shelter, plant yellow birch (Betula alleghaniensis), monarch birch (B. maximowicziana) or the elegant Betula costata. The genus Populus is derived from the Latin vernacular name for a group of plants that includes aspen, cottonwoods and poplars. These deciduous trees are often used as wind breaks and visual screens. 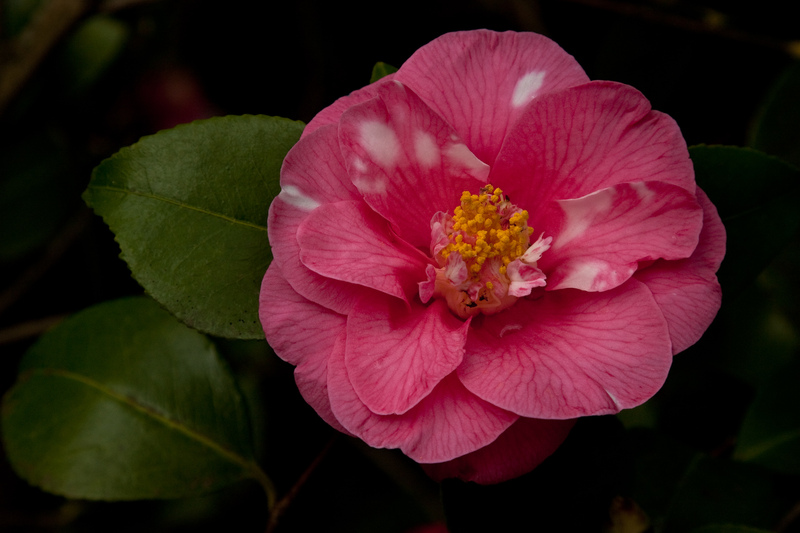 Camellias come to us from eastern Asia, especially Japan and China. Featuring showy and elegant blooms in white, pink, red or yellow, these trees and shrubs are attractive standing alone or planted en masse as a hedge. They can also be used for topiary and espalier. If you drink tea, you may have tasted the leaves of Camellia sinensis. However, you don’t just pick tea leaves and add water. Tea goes through many distinct stages of processing between harvest and infusion. 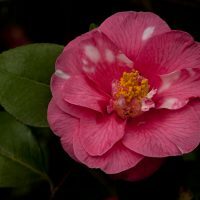 Camellia flowers come in many forms, from “single” to “formal double.” To see the wide array of shapes and hues, visit the camellia grove in March, April and October to catch a wide range of speciens and cultivars in full bloom. Cultivars of note include Camellia sasanqua ‘Tago-no-tsuki’, C. ‘Showa-wabisuke’ and C. pitardii var. yunnanica. Another prominent member of the Theaceae or the tea family in the Arboretum is Stewartia. 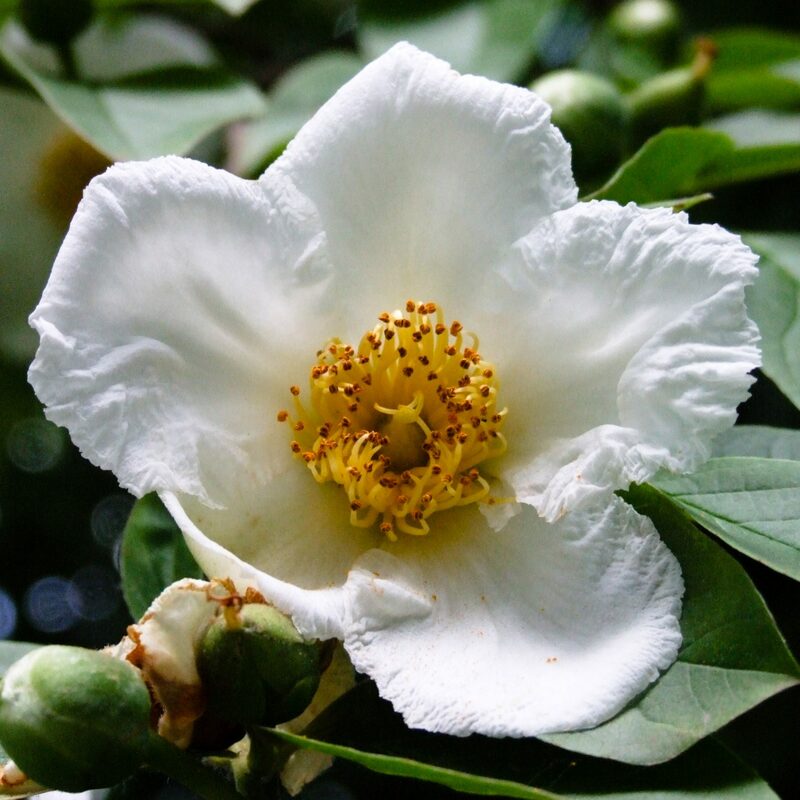 The Arboretum has impressive specimens of 8 species of stewartia, with many examples of mature Stewartia monadelpha, and Japanese stewartia, S. pseudocamellia highlighting the collection. If you are looking for a tree that provides color and interest year round, try a Japanese stewartia. 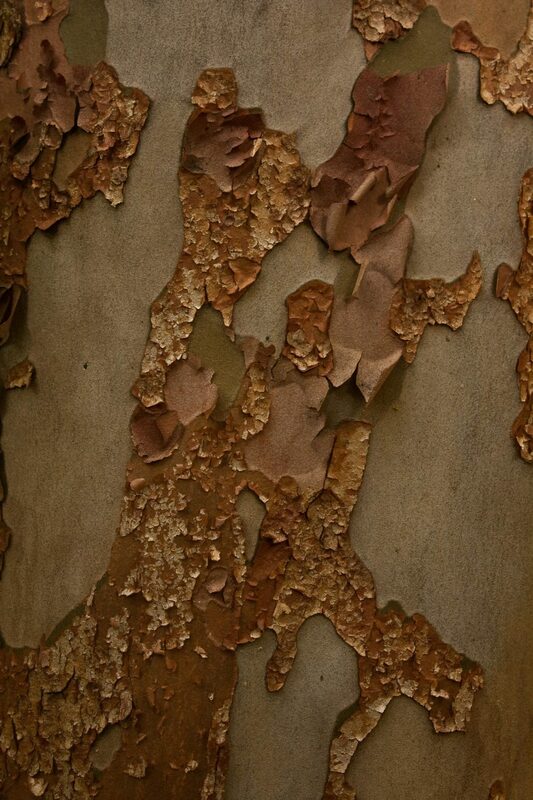 This tree’s bark exfoliates in strips of gray, orange, and reddish brown once the trunk is a few inches wide. Its serrated foliage emerges bronzy purple in spring, deepens into a dark green by summer and turns red or orange in autumn. White camellia-like flowers burst forth in midsummer, and brown seed pods follow in the fall. Clearly, the camellia family garden is worth a visit any time of year! Hawthorns are primarily deciduous trees and shrubs found in temperate woodlands. Their flowers, most often found in clusters, range from white to deep pink or red. Not surprisingly, given their name, hawthorn branches are often thorny. Fruit produced by hawthorns is known as a “haw.” The small, round haw might look like a berry at first glance, but it’s really a “pome.” This is the type of fruit produced by plants in the subfamily Maloideae of the family Rosaceae. One pome fruit you already know is the apple. Many cultures have a long history of cooking with haws. In Ottawa, Canada, hawberries, which grew particularly well in the distinctive alkaline soil of Manitoulin Island, kept pioneer settlers alive over winter. Jellies made from the fruits of three native species known collectively as mayhaws are a specialty in the southern United States. In many parts of Mexico, tejocotes (the fruits of Crataegus pubescens) are popular in winter, when they may be eaten raw, cooked to make jam or punch, or stuffed into pinatas. Hawthorn leaves and flowers have a long tradition of medicinal use, most commonly to strengthen the heart. Many birds, bugs and critters make their homes, or at least take their meals, in hawthorns. Thrushes and waxwings eat the haws and later spread hawthorn seeds in their droppings. Deer nibble on hawthorn trees throughout summer and fall. Hawthorn flowers nourish many nectar-feeding insects. This genus Ilex includes more than 400 species of evergreen and deciduous trees, shrubs and climbers whose geographic range extends from the tropics and subtropics to temperate regions. 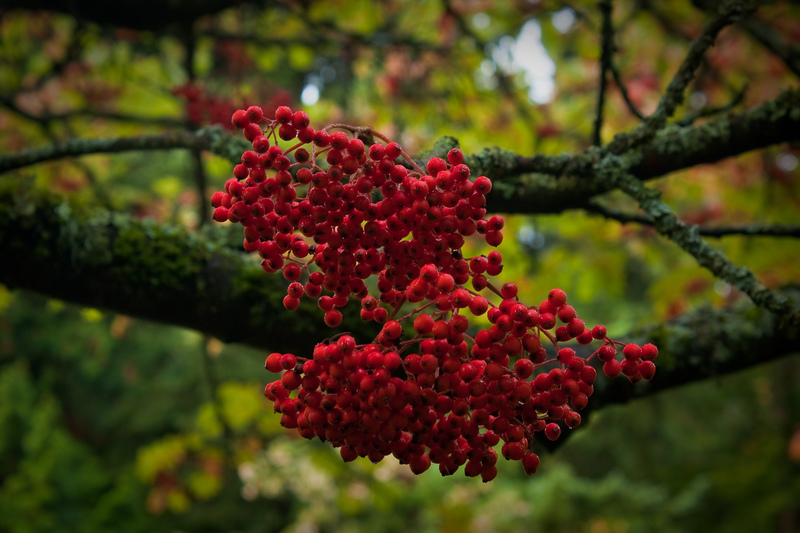 Hollies are enjoyed for their distinctive foliage and bright berries. The berries are toxic to humans and may cause vomiting and stomach aches, or even death if too many are consumed. Holly berries are, however, an important food source for many birds and some other wild animals in winter. When they have frozen or frosted several times, they become soft and mild enough for birds to find them palatable. As dense shrubs, hollies also provide birds with shelter during storms, and species with spiny leaves offer great protection from predators. The hollies are at their peak from November through February. Don’t miss the famous hedgehog holly, Ilex aquifolium ‘Ferox Argentea’, in the holly collection. Our collection is the Nationally Accredited Plant Collection™ for Hollies (Ilex), administered through the Plant Collections Network of the American Public Gardens Association. The nearly 1000 species that make up the genus Rhododendron grow in many habitats from alpine tundra to dense forest, and at various elevations from sea level and to the tops of mountains. Nearly 300 species hail from subtropical climates. But most of the species that are known to temperate gardeners grow best in climates that avoid extremes in temperature and have substantial rainfall and a slightly acid soil, such as Pacific Northwest coastal regions. Rhododendrons grace many gardens throughout this region. The Pacific rhododendron, Rhododendron macrophyllum, which means “rose tree with large leaves,” is Washington’s state flower. The Arboretum features species and hybrid rhododendrons. Hybrids result from the cross-pollination of one species with a different species or hybrid. The offspring produced may look quite different from either parent. Hybridization occurs naturally when two or more species growing near each other in the wild flower at the same time. A hybrid rhododendron, however, is more likely to have been artificially created by pollinating by hand. Hybrids are created in a quest to produce a new plant with certain desirable characteristics, such as larger flowers, flowers in different forms or different colors, or flowers that are more resistant to cold or tolerant of heat. There are tens of thousands of hybrid rhododendrons. Each cultivar is given a unique name that always appears in single quotes – for example, Rhododendron ‘Blue Diamond.’ The Puget Sound region has long been a hotbed of Rhododendron breeding. Our relatively mild winters make for a long blooming season. Visit anytime from February through June to see rhodies in bloom. The flowering plants known as azaleas also belong to the genus Rhododendron. Azaleas can be deciduous, evergreen or semi-evergreen. Deciduous azaleas are native to the eastern and western areas of the United States and Canada, Japan, China, and scattered locations across eastern Europe. Evergreen azaleas are found only in eastern Asia. Hybridizers have made innumerable crosses among azaleas, as they have among other rhododendrons, and there are thousands of hybrids. Azaleas can be more heat tolerant than other rhododendrons, so they are particularly popular in warmer climates, including the American southeast and lowland Japan. 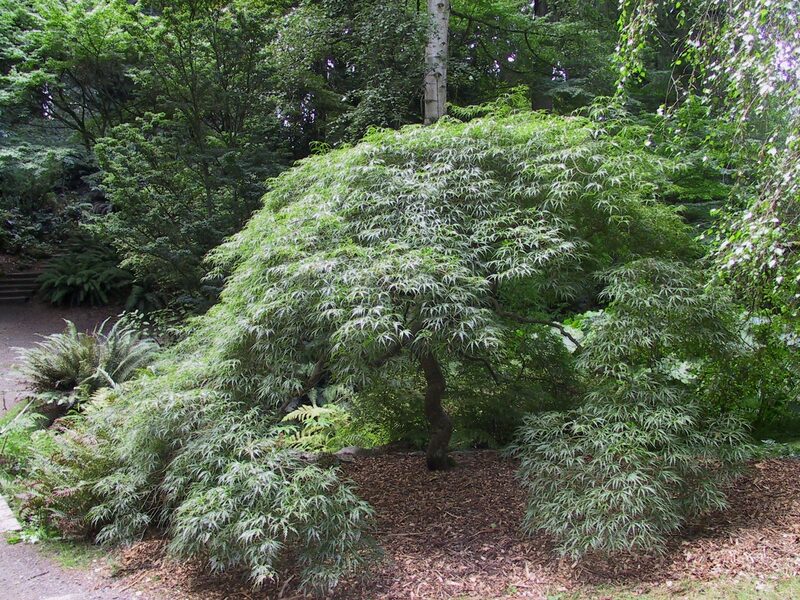 Native to Japan, China and Korea, the Japanese maple was introduced into England in 1820. In Washington Park Arboretum, you’ll see that the many cultivars of Acer palmatum come in a range of shapes and hues. Many are low-growing shrubs; others are tall trees. Some have leaves that are bright green in spring and summer and then take on hues of yellow, orange or red in autumn. Cultivars such as ‘Bloodgood’ or ‘Emperor I’ are prized for leaves that are dark red-purple throughout the growing season. Looking around Northwest neighborhoods, you’ll see that Japanese maples frequently are used in landscaping. They are also a popular species for bonsai, the art of growing miniaturized forms of trees and bushes by rigorously pruning their roots and branches. In a strict sense, the term “Japanese maple” refers to the numerous cultivars of a single species, Acer palmatum. However, some horticulture writers include close relatives, such as Acer shirasawanum and A. sieboldianum, and at least one goes so far as to include all maples native to Japan. 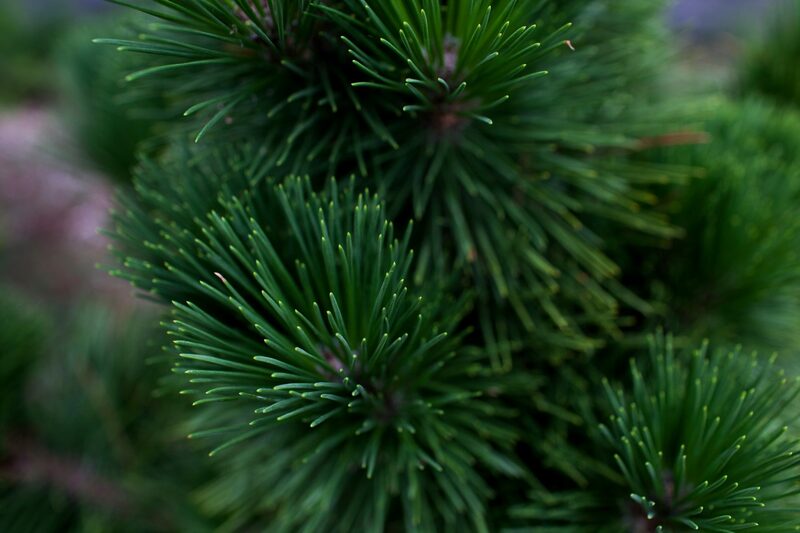 Many people think that all conifers are evergreen. 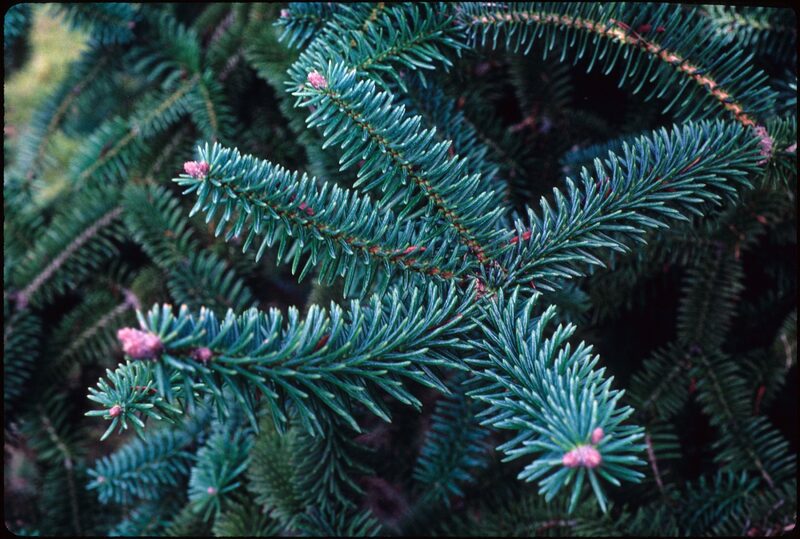 True, most conifers – cone-bearing trees such as cedars, firs and spruces – remain evergreen by retaining their leaves for more than one growing season. However, the larch is a deciduous conifer in the pine family. Foliage is typically bright, soft green when it emerges in spring and takes on a brilliant golden yellow or even red hue just before the needles drop off in autumn. At high latitudes in Alaska, Canada, Scandanavia and Russia, larches grow in lowland boreal forests. As you move further south in the United States, Europe, China, Korea and Japan, you need to head higher into the mountains to find larches. 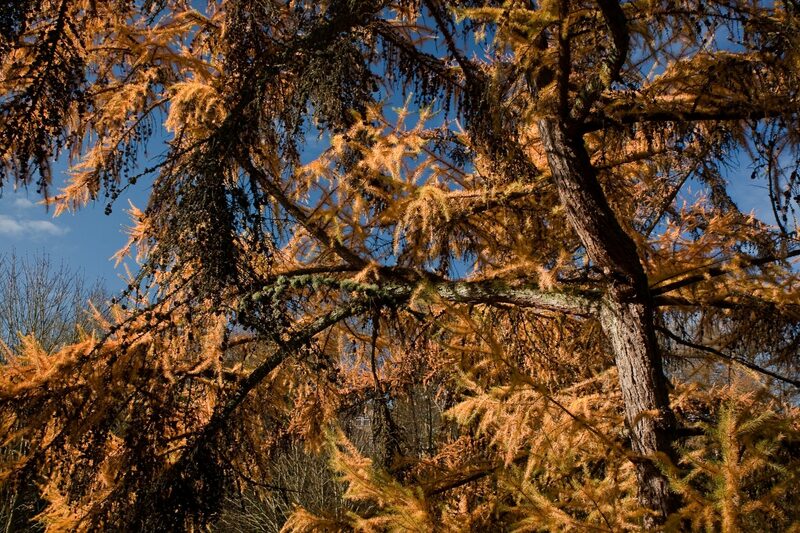 Visit the Arboretum between late September and mid-October to catch larches at their peak color. See the words “pea family” and you might start thinking about vegetable gardens, but there are also plenty of woody – and often highly toxic – plants in the pea family or Fabaceae. Albizia julibrissin, the silk tree, is native to Asia. It is cultivated throughout warm temperate and tropical regions of the world. 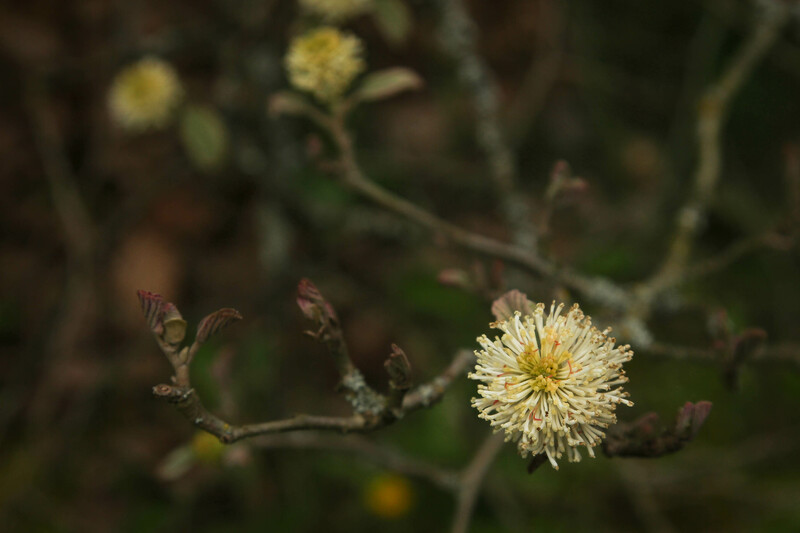 Silk trees have fine filigree foliage and attractive flowers, which appear delicate and light due to extra-long stamens. Another pea family member is Gleditsia triacanthos, honey locust. These deciduous trees have fern-like leaves, small greenish-white flowers and sometimes spiny trunks. Robinia is another genus that is commonly known as locust. This group of deciduous trees and shrubs has pink or white flowers that are sweetly fragrant and hang from the branch tips in drooping chains. Laburnum is known commonly as golden chain tree. You’ll see why if you visit in spring when cascades of yellow flowers fall from every branch. These deciduous trees grow in thickets and woodlands in the mountainous areas from south central Europe to western Asia. The fine leaves of Genista are overshadowed by an abundance of small yellow flowers. Many of these species are native to the Mediterranean region and they thrive in hot, sunny places with poor, dry, rocky soils. The deciduous Chinese scholar tree, Styphnolobium japonicum, is native to China and Korea and can grow to 60 feet tall. The creamy white flowers are slightly fragrant. Like other pea family members, the scholar tree is remarkably tolerant of pollution and other environmental stresses and is often planted in urban settings. Trees in the genus Tilia go by one of three names – basswood, lime or linden. The American linden, Tilia americana, is a columnar tree, while the little-leaf linden, T. cordata, has a pyramidal form. These stately deciduous trees come from woodlands in North America, Europe and Asia. Their ovate dark green leaves are toothed or lobed and have tapered or pointed tips and a heart-shaped base. Their small, creamy, fragrant flowers are followed by dry nut-like fruits. You’ll frequently find them planted along avenues. Magnolias have a long history. Fossil remains indicate that magnolias are among the most ancient angiosperms (flowering plants) and have changed very little in 100 million years. Magnolias are named in honor of botanist Pierre Magnol, director of the Montpellier Botanic Gardens, the oldest university garden in France. Magnol’s major contribution to horticulture was developing the concept of plant families, a natural classification system based on combinations of morphological characteristics (features which relate to the form and structure of organisms). The magnolia family, Magnoliaceae, is made of up two sub-families: Magnolioideae, which encompasses the genus Magnolia, and Liriodendroideae, which includes the genus Liriodendron. You’ll find representatives of both subfamilies in this Arboretum collection. Large, fragrant, exquisite flowers often arrive before the tree’s scant foliage and are certainly the main attraction. Don’t miss Magnolia wilsonii (May), M. campbellii (early March) and M. dawsoniana (early March), a few of the most notable species in our magnolia collection. To see the magnolias at peak bloom, visit between March and May. If you visit in autumn, look above the magnolias to the upper canopy. You’ll see that the saddle-shaped leaves of the tulip tree, Liriodendron tulipifera, and the Chinese tulip tree, L. chinensis, have turned a deep buttery yellow. Our collection is part of a multi-site Nationally Accredited Plant Collection™ for Magnolias, administered through the Plant Collections Network of the American Public Gardens Association. 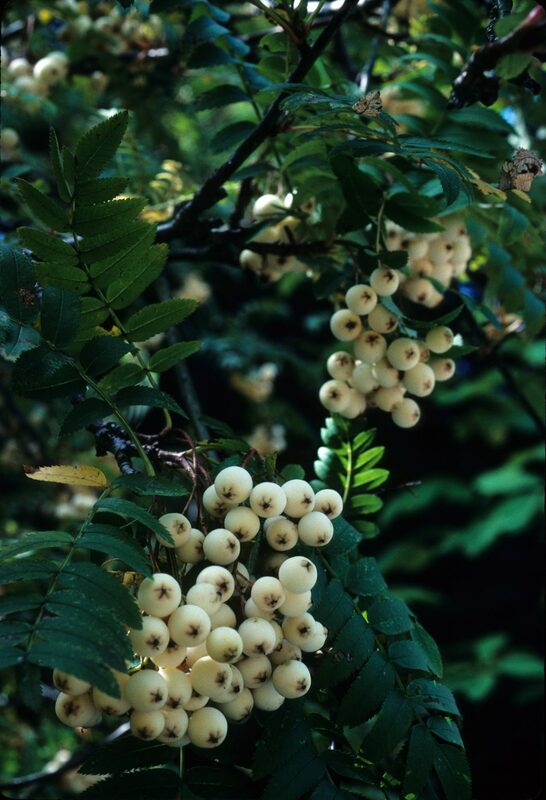 The genus Sorbus, or mountain ash, includes roughly 100 species of deciduous trees. They grow in northern temperate regions and flourish in woodlands, on hills and mountains, and on rocky slopes. Gardeners plant mountain ashes for their ornamental leaves and fruit. The leaves are entire or pinnate and take on beautiful hues in autumn. 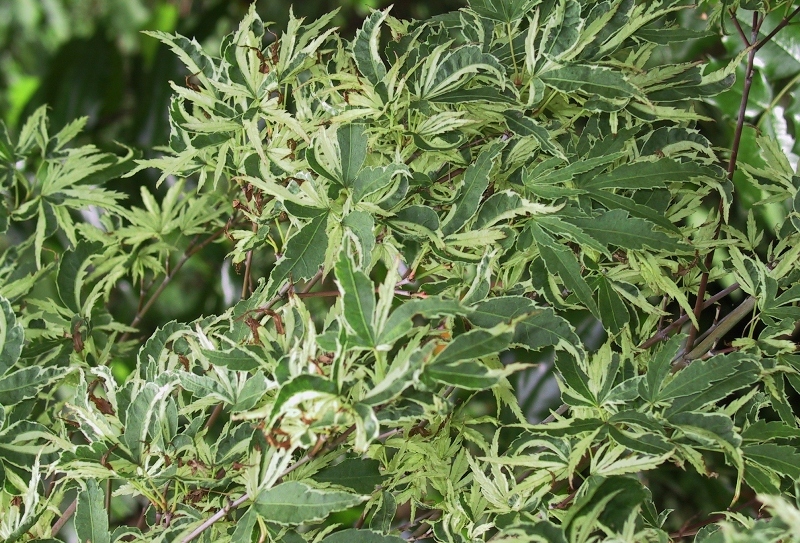 The pinnate-leaved species look similar to the compound leaves of the true ash (Fraxinus spp. ), which is how the mountain ash acquired its common name. The clusters of fruit, which look like berries but are actually pomes (see Hawthorns for an explanation of pomes), may be white, yellow, orange, pink, red or brown depending on the species or cultivar. Mountain ashes make a good snack for many birds and mammals. Moose eat its foliage, twigs and bark. White-tailed deer, fishers, martens and snowshoe hares also browse in mountain ashes. The fruit is eaten by small mammals and numerous birds, including ruffed grouse, ptarmigan, sharp-tailed grouse, blue grouse, jays, thrushes and waxwings. The mountain ashes are at their flowering peak in May and fall color appears during October and November. Many species make excellent small trees for urban gardens. Our collection is one of the finest in North America and is named after our former longtime director, Brian Mulligan, who had a special fondness for the genus. The oak or beech family, Fagaceae, includes 6 to 8 genera, notably Quercus (nearly 600 species of oak), Fagus (10 beech species) and Castanea (8 to 9 chestnut trees and shrubs). The members of this family are either deciduous or evergreen and all species are monoecious, meaning their male and female reproductive parts occur in separate flowers on the same plant. Oak leaves come in a variety of sizes and their shapes range from entire to toothed to deeply lobed. Oak trees produce acorns, the small brown nuts that follow the flowers. Beech leaves are typically oval in shape with either coarse or fine teeth. These hardwood trees are frequently used for flooring and furniture. You may know that oak barrels give certain wines, like Chardonnay, their characteristic flavor. Did you know that wood chips from beech trees are used to flavor beer? Another edible contribution is the roasted chestnut. From our cabinets to our snacks and beverages, kitchens just wouldn’t be the same without the Fagaceae! When you visit the Arboretum, be sure to check out these special oaks and beeches: Japanese blue oak (Quercus glauca), Japanese evergreen oak (Q. acuta), Chinese cork oak (Q. variabilis), cutleaf European beech (Fagus sylvatica ‘Asplenifolia’) and the purple-leaved Rohan beech (Fagus sylvatica ‘Rohanii’). Our collection is part of a multi-site Nationally Accredited Plant Collection™ for Oaks (Quercus), administered through the Plant Collections Network of the American Public Gardens Association. Most areas and collections within the Arboretum are named for a single species, genus or family. But you’ll find a variety of conifers in the Pinetum, not just pines. In the early 1800s, land owners in Great Britain called conifer collections pineta (plural of pinetum) because it was thought that all conifers were pines. During this era of great estates and the English landscape movement, large collections of exotic conifers became fashionable as symbols of status and wealth. As time passed, these great collections matured and taxonomists of the 19th century shed new light on conifer classification. While conifers have now been re-classified into several families and many genera, the old term ‘pinetum’ is still used to describe a diverse collection of conifers. Be sure to look for the huge cones of the Coulter pine (Pinus coulteri) when you visit. Speaking of big, three more conifers that you shouldn’t miss are the Dawn redwood (Metasequoia glyptostroboides) along Arboretum Creek, and the coast redwood (Sequoia sempervirens) and giant sequoia or Sierra redwood (Sequoiadendron giganteum) near the Lynn Street entrance to the Pinetum. These giant trees are all more than 70 years old and 80 feet tall. Some of these trees are deciduous and some are evergreen, but each looks great all year, so you can enjoy a visit to the Pinetum any time. True ashes are primarily deciduous trees found in woodlands across Europe, Asia and North America, but there are a few evergreen species in the subtropics. Ash leaves are opposite and pinnate, and their delicate, clustered flowers bloom in spring and early summer. Commonly known as “keys” or “helicopter seeds,” ash seeds are a type of fruit called a samara, which has a flattened wing of fibrous, papery tissue extending from the ovary wall. You can toss an ash seed into the air and watch it spiral back down to earth. Ash is a hardwood that is quite strong but has an elastic quality. This strength and resilience make it a good choice for bows, tool handles and baseball bats. It is often used for electric guitar bodies, since the wood gives the instrument a bright, cutting tone. In the Arboretum’s ash collection, look for the Chinese ash (Fraxinus chinensis) in October with its brilliant fall color. About 65 species of deciduous trees and shrubs are members of the walnut family, Juglandaceae. Along with walnut, other nut trees in this family are pecan and hickory. With furrowed bark, large aromatic leaves, and edible nuts surrounded by hard thick shells, they make fine specimen trees. They do get rather tall (up to 100 feet) and broad (up to 50 feet), so if you don’t have space to grow your own walnut tree, you can always visit this grove in the Arboretum. 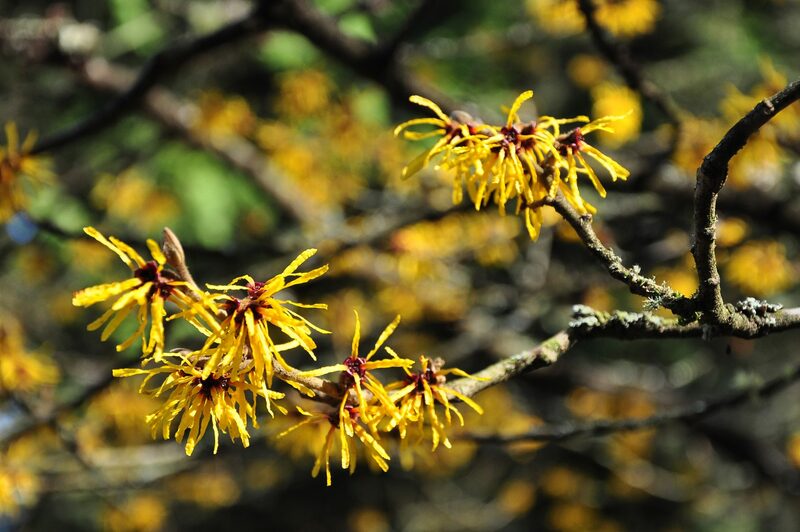 The witch hazel family, Hamamelidaceae, includes witch hazel, witch alder, winterhazel and several other species. These deciduous shrubs have alternate, simple leaves and are typically found in woodlands or along riverbanks. Many have similar, hazel (Corylus species) type leaves with prominent venation and lightly serrated leaf margins. Their flowers, a cluster of narrow petals, look a bit like colorful spiders. When you visit, be sure to look for the evergreen and winter-blooming Chinese fighazel (Sycopsis sinensis), and the redbud hazel (Disanthus cercidifolius) which takes on a deep burgundy shade in autumn. 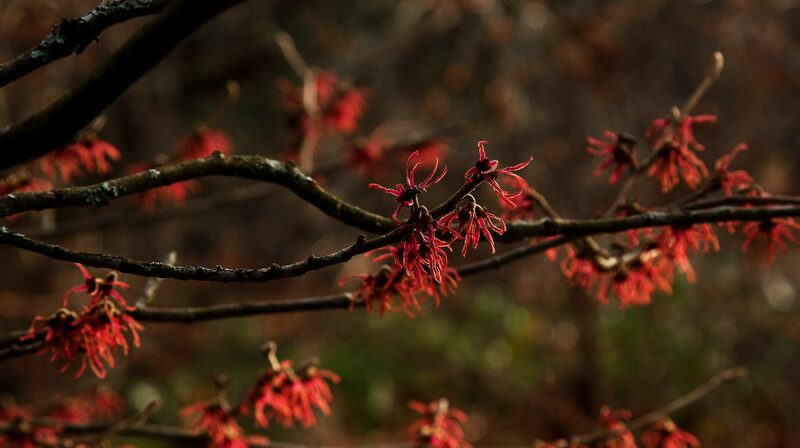 The Arboretum’s witch hazels have two peak color seasons, October when their leaves turn and January-February when their flowers bloom. The Arboretum’s collections are centered in the J.A. Witt Winter Garden and in the Witch Hazel family area east of the new Pacific Connections Garden. Open: Every day dawn to dusk, free of charge. Visitors Center open daily 9:00am – 5:00pm. 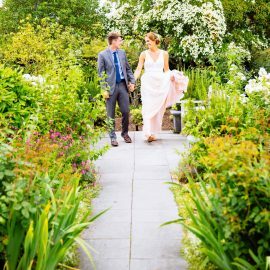 We have two beautiful venue spaces: the Center for Urban Horticulture and the Washington Park Arboretum.